I was chatting with a customer from Yorkshire recently. He lives just down the road from Richmond, where the HQ and museum of my family regiment is housed in a beautiful old church, I was reminded of taking the train up there as a mustard keen 19 year old for an interview with the Regimental Secretary. Anyway, the conversation turned to carving clubs and he mentioned that he was a member of the West Riding Woodcarvers Association. The club is currently working on a series of carved panels depicting scenes from the first and second world wars which will eventually be displayed at the Royal Armouries in Leeds. Each member takes a pre-sized block of timber and a design and carves it in their own time, the whole is then assembled and displayed. The club have already created similar panels for several local hospices which are donated free of charge and have earned them royal recognition in the form of a Queens Award for Voluntary Service. As well as providing an enjoyable project for the club members, the panels add warmth and interest to the environment in which they are displayed in a way that a two dimensional image couldn't match. They also serve to draw public attention to both the club and carving in general. I believe this is a fantastic way for carvers to help their local communities and bring a touch of warmth to people who so desperately need it. Another amazing thing that we can all do at this time of year is fold up a donation, drop it in the tin, and 'wear your poppy with pride'. By the way - a wee dab of superglue is all it takes to keep the leaf in the correct position and stop you looking like a politician. Many thanks for mentioning our Club in your blog and the excellent wording. Towards the end of November we shall be including on our web-site the story of the two 9' x 4' carved Panels depicting the 1st and 2nd World War that will eventually be displayed in the Royal Armouries Museum, Leeds. 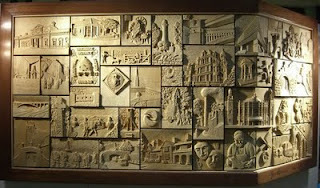 With the story will be photos of the majority of the 96 individual carvings as they progress to completion. We shall be very pleased to create a link on our web-site to workshopheaven.com and workshopheaven/blogspot.com. Many thanks for the update John and please pass on my admiration and respect to the carvers involved if you get the opportunity. I'm sure I shall be one of many following your progress with interest.